Tag line: "Before - A Beautiful Girl. One Moment Later - A Skeleton!" Trivia: The filmmaker was on such a tight budget that the film's ultimate weapon, the "focusing disintegrator", was actually a Hubley's Atomic Disintegrator toy cap gun, bought for a dime, with a flashbulb added as a beam. 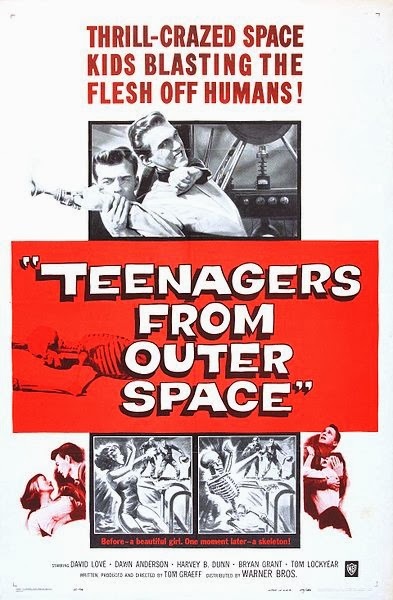 Teenagers from Outer Space is an odd little film from 1959 about a kindhearted alien named Derek (David Love) who comes to earth with his colleagues looking for a planet to house the Gargons, a giant, lobster-like race that’s also the aliens’ chief source of food. Because of their size and the fact they multiply at an alarming rate, the Gargon have a tendency to take over as the dominant species on whatever world they occupy, and from the looks of it, earth is a suitable habitat for the creature. Even still, Derek, fearing for the safety of the planet’s current inhabitants, tries to convince his fellow aliens to continue the search in another part of the galaxy. This doesn’t sit well with the others, and before he knows what’s hit him, Derek is being chased away by Thor (Bryan Grant), the most violent of the group, who, with his trusty ray gun, is sent to track Derek down and, if necessary, kill him to protect the security of their mission. While on the run, Derek meets Betty Morgan (Dawn Anderson), a pretty teen living with her grandfather (Harvey B. Dunn). Luckily, Betty and her grandpa have a room available, and are more than happy to rent it to Derek (despite the fact he doesn’t have a cent to his name). While Derek is getting to know his new human friends, Thor continues to search for him, leaving a trail of skeletons in his wake (the ray gun Thor wields is so powerful that it vaporizes its victim’s flesh, leaving only the bones behind). While eluding Thor, Derek also tries to warn Betty and the others that, unless they do something about the Gargons, their world will soon come to an end. Bottom line, Teenagers from Outer Space is not a good movie. For one, Derek and his compatriots have an unusual way of talking, using very few contractions when they speak, which makes for some clumsy dialogue (shortly after they arrive on earth, Thor shoots Betty’s dog with his ray gun, which doesn’t sit well with Derek. “It had life”, he tells Thor, “And that life you had to take to satisfy your endless hunger for killing“). This, of course, is just the beginning; the film also features poor special effects (aside from the scenes where Thor reduces his victims to skeletons, which is a cool concept, the effects are practically non-existent, especially when it comes to the giant Gargon, which we only see as a shadow on the wall), and the performance of Harvey Dunn as Grandpa has to be seen to be believed (he’s arguably the goofiest senior citizen ever to inhabit a sci-fi film). Yet, even with its many deficiencies (or, more than likely because of them), I had fun watching Teenagers from Outer Space. The story itself, about an alien race looking for a planet to house its food supply, is a clever one, and the scenes with Thor had a definite energy to them (did I mention how awesome it was that he could turn people into skeletons?). There’s no denying Teenagers from Outer Space is a bad film, but, in my opinion, it fits neatly into the “so bad, it’s good” category. You're right, this is certainly not a great film, but it does have a particular charm to it that is hard to identify. Are you familiar with the lunacy of the film's director? It's really a fascinating story. This movie is one that I'm covering for this month's phobia theme (Ephebiphobia: The Fear of Teenagers), so if you're interested in hearing more about it, please check it out.